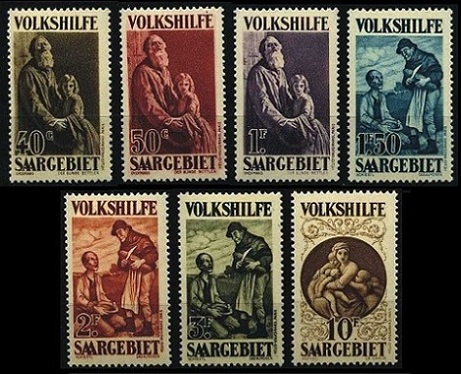 Between 1926 and 1928, the Saar Plebiscite Territory, "Saargebiet" or "Saar Occupation" in German, issued their first surcharged charity stamps and a brand new series of definitive postage stamps. On October 25, 1926, the four "Volkshilfe" or "Charity" stamps shown above (Mi. #104-07, Sc. #B1-4) were issued. The new stamps were photogravure, unwatermarked, and perforated 13 1/2. The surtax was to raise funds for charitable organizations. The four designs feature a red cross dog leading a blind man, a nurse with an invalid, children drinking at a spring, and a maternity nurse with a child. On October 1, 1927, the identical charity stamps were re-issued (Mi. #122-25, Sc. #B5-8) with the overprint "1927-1928". At the end of 1926, the Saar Plebiscite Territory began issuing a brand new series of pictorial definitive postage stamps. The 1926-1927 issues are shown in the first three images above (Mi. #108-21, Sc. #120 // #135). These new stamps were wider than the previous definitive postage stamps, and one could say the stamps were beginning to get that French-colonial-postage-stamp "look" to them. These new stamps were printed in photogravure, and they were all perforated 13 1/2. 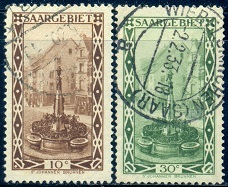 The designs, which are repeated throughout the set, feature (in the order of their appearance): the Market Fountain in St. Johann, a view of the Saar Valley, a scene from the Saarlouis fortifications, Colliery Shafthead, Tholey Abbey, and the Burbach Steelworks. In September 1928, two airmail stamps were issued. They are shown in the last scan above (Mi. #126-27, Sc. #C1-2). Though intended for airmail service, they were also used as regular postage stamps. The design features a biplane flying over Saarbrücken. On December 23, 1928, the third set, in what would become an annual charity stamp issue, was placed on sale. These seven new stamps, shown above (Mi. #128-34, Sc. #B9-15), have the same physical characteristics as the previous (and subsequent) annual charity stamp issues. The three designs, repeated in the set, feature details from paintings representing "charity", as follows: "The Blind Beggar", by Dickmans (1811-1888), "Almsgiving", by Schiestl (1869-1939), and "Charity", by Raphael (1483-1520). The charity issues of Saargebiet are very popular with thematic collectors of Art / Paintings on Stamps, which has resulted in these sets becoming quite expensive. The 1928 set, containing the painting by Raphael, is the most expensive. Subsequent issues, though not cheap, are more affordable.